Chromebook and Chromebook Management Console. 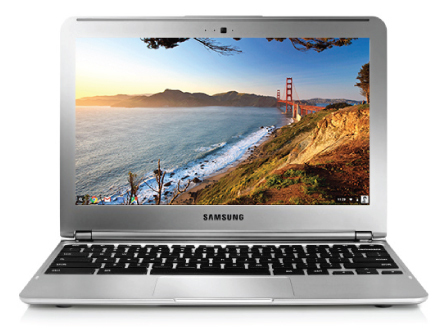 Why Chromebooks in the Classroom? Chromebooks in an educational setting give students, teachers, and administrators a simple solution for fast and easy-to-manage computing. Chromebooks provide students with access to the web's vast education and collaboration resources. For the administrators, Chromebooks offer centralized device management and a low total cost of ownership. Chromebooks improve teaching and learning by eliminating the distraction of technology challenges. They boot in less than 10 seconds and resume instantly – eliminating the typical downtime wasted while traditional computers start up and connect to a network. A 6.5 hour plus battery life means Chromebooks last an entire school day. Students can connect a Chromebook to the internet anytime and anywhere with built-in Wi-Fi or 3G, so they can continue learning after school and at home. With just a few clicks, administrators can update settings for the entire fleet of Chromebooks- whatever the size – pushing or removing web applications and enforcing safe-browsing policies for all users. Automatic updates keep the operating system and applications fresh, with no need for tedious backups, security patches, data migration, or re-imaging. We offer Chromebooks from leading manufacturers that provide fast, portable computing with exceptionally low total cost of ownership. The best of Google products, security, and hassle-free management are built right in. Camcor delivers turnkey technology solutions and “White Glove” services customized for specific education customer needs. In addition, we can provide asset tagging and etching services for your deployment. Robust pre-sales and post-implementation service options maximize the user experience with advanced consultation, end-user support for teachers and admins, and onsite training. Chromebooks are a new type of computer designed to help you get things done faster and easier. They offer your favorite apps, security built-in, easy central management and other features and are ideal in an educational environment. Chromebooks come in a variety of configurations from quality OEMs, including Acer, HP, Lenovo, and Samsung. They offer exceptional total cost of ownership providing powerful computing that loads lighting fast and offers hassle-free operation. Chromebook updates itself, for free, so you’ll have the latest and greatest version -- no need for manual downloads and upgrades. Camcor understands that use of a new technology in the classroom will be successful only if the teachers are confident in their mastery of the technology, and it intuitively fits in the curriculum. The most successful school districts agree that teacher training tops the list when implementing new technology into the classroom. Camcor offers a complete suite of service options for educators and network administrators. Comprehensive service offering of technologies such as networks, network security, bandwidth, and related hardware. Track assets - Assign devices to users and get configuration and usage reports. Pre-install and block apps - Blacklist, whitelist, or pre-install apps, extensions and URLs. Create user groups - Apply policies, apps, and settings to different sets of users. Control user access - Control who uses your Chromebooks: prevent outside users from logging in, disable Guest Mode, or designate the specific users within your domain that can use a Chromebook. Configure network access - Set network and proxy settings to make it easy for users to get up and running and ensure they're protected by web filters and firewalls. Customize user features - Modify user settings like bookmark and app sync across computers and brand your devices with custom Chrome themes.